what people don't know is that only 2 of the suitcases actually hold our clothes! Everytime we fly this makes me laugh seeing my mom...push all these...because she won't let me lift anything...being pregnant and all! this was her shoving off! I must say all of my luggage has failed me, broken, zippers come off, bags ripped open..wheel falling off....well they do travel alot....but the best bag of all has been my hard case zebra bags..."the one on the bottom" in these pictures! 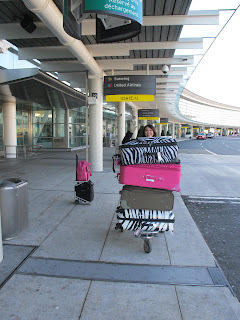 Tht's alot of suitcases..Love the pink and zebra stripes combination when its on the trolley! Show us how u pack! I can't wait..
lol! dang, mama handling all of those suitcases! I looooove the zebra ones, so need them in my life....i imagine that they are VERY easy to spot on the carousal! oh man the airport workers/luggage handlers really mess up your suitcases. they did that to me. everytime i have mine, it's either wet and cold, scuff marks or a zippers gone! Hi Kandee, my name is Sarah Daggett. I saw the post you did about KRISTIE TUNICK and I really want to do something to help. I had the idea to start a wedding fund for her and Brian so when she gets better they can have the wedding of their dreams. My problem is that I live in Ecuador now and I can't use a bank account... from Ecuador for PayPal so I wanted to see if we could work together on this and you could open a paypal account for donations.I have been blessed with the most amazing man I could ask for and I want to help another couple with some obstacles in their path. Here is my email: Sarahlicious15@yahoo.com I really hope you read this and contact me because I don't know of any other way I can do the fund. Kandi I LOVE your mom! She seems so supportive and loving. I know you know this, but you are REALLY blessed to have her. Hi Kandi's mom!!! Kandee Omg your mom is so cute. I'm dying to know where did she get those hot red boots?? I LOVE THEM! Where Did you get your "Pink and Zebra" luggage? So Cute! 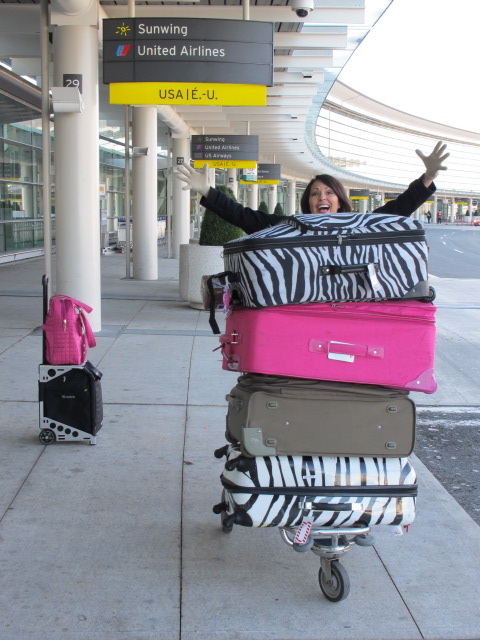 I LOVE your luggage Kandee! I dont have any luggage at all, don't need it yet, but when i do ill probly have you in mind! ha ha. Oh i got the hello kitty purse, just got it today in the mail!! purse twins! Aw, like someone else previously posted...When you get the time, a video about packing and how to transport makeup would be AMAZING. I seem to throw all my things in one little red zippy pouch and throw it in my suitcase to be abused, bumped, and bruised on the way to my destination. The worst thing I hate about traveling, is all the "hurry up and wait"ing. Hope your travels are safe and you have a WONDERFUL day Kandee! Sending Love, Hugs, and Patience for waiting in lines! I need a mama that will do something like that! OK...Not a mama cause mine was amazing. How-about-a great friend! Yea! I like that! :) We all need a Bestie like your mama! Just like you guys I fell in love with Kandee's Zebra Luggage. I ordered the carry on hard case Zebra print from Boscov's, & since it seems like most of you guys are interested here's the link, there's a complete set of 4, or you can buy them separately. FYI they also carry a leopard print set. You Are My Fav person in the whole wide world i read your bblog every day after school and every night befoore bed i watch your video and i go to bed happy!!! I cant explain to u how much your video make me happy. I love you blogs. and your Mom's BOOTS! Hi fellows! We all know already that Anti aging makeup tends to be a little more emollient to address dryness. I have oily skin, so, I couldn’t use the anti aging makeup in the t-zone area. 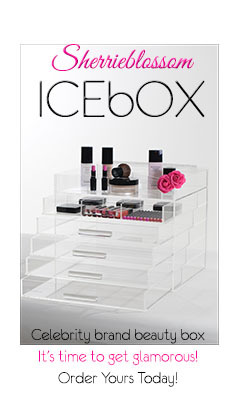 So, I consulted with Tasha.com Company about makeup tips. They helped me well. Ooo zebra bags, i have the same one.. Its my favorite! you're mom is so cute! I coulda sworn that was you playing around with the suitcases! Thanks for sharing tips on traveling in style. I was HACKED but now I'M BACK!!!!! This is all I got! Things I take off every night! Oh loss, of a part of me! Self-Portait from a Photo Shoot! Fall Make-Up on my mom! Oh please don't let me feel like a nerd! I need a WAY OUT!!!! !